HomeBankruptcy court sends Connor Cochran to liquidation, with new details about his shady business for The Last Unicorn Tour. WAS COCHRAN TRYING TO GET PAID AGAIN FOR ALREADY-SOLD PRODUCTS? Look at that $6 million budget from 2012. (Page 19.) He was trying to get “targeted” funding from investors, SEVEN YEARS after taking orders for the products and promising delivery to customers. On top of that, it lists international publishing deals (Page 20) with 2015 delivery dates that had already repeatedly failed. It’s a new document but a familiar story. 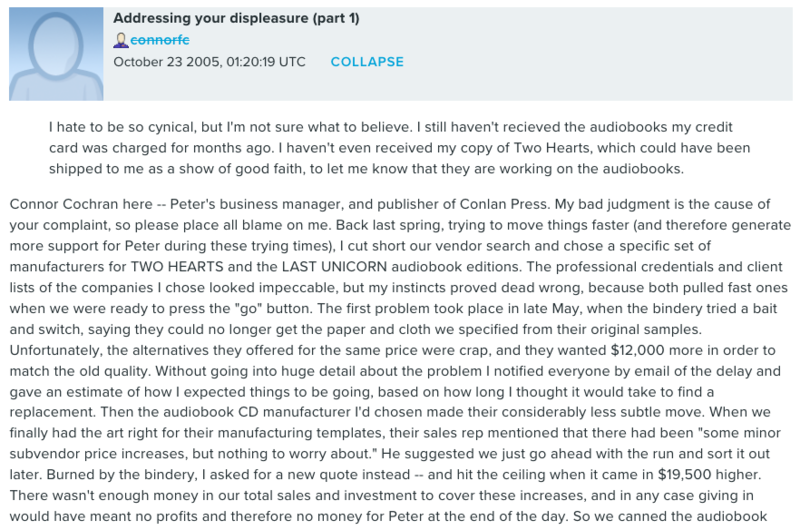 Look at this LiveJournal post (archive) from 2005 about products he claimed were ready to manufacture. He said he was “ready to press the ‘go’ button“, then excused nondelivery with a “dog ate my homework!” story. It’s a good example of Cochran misleading people and covering up with excuses. It repeated in May 2007 when the Conlan Press “The Raven” newsletter promised the product was ready to go to printers, but the dog ate the homework again and more help was needed. How many times? Countless hundreds or thousands of customers never got goods they were promised. If you’re not listed as a creditor, you have a claim that may persist after bankruptcy. Speak out! It’s not. He simply made promises he could never keep, with ever-growing greed while evading obligations and bullying those who spoke out, until the bubble burst. Creditors now asserting claims include Peter Beagle, Sandbox LLC, and Cochran’s lawyer Rimon PC who hasn’t been paid over $600,000 for legal services. Service for Cochran included what a judge called “frivolous” litigation to bully Peter, and that lawyer wants his pay for it to come from the value of Peter’s creation. Speaking of bullying: If Cochran could countersue Sandbox LLC, he probably would as he’s done to others. But the way he was forced to settle with them in 2016 is a clue about how badly he acted and how desperate he was. The settlement (Page 22) only bought him an extra year to pay hundreds of thousands of dollars. Meanwhile he promised a new movie tour to make money without Peter – while claiming settlement with Sandbox was vindication for him. So sad that didn’t last. Did he expect to kill Peter’s lawsuit and find a big investor too? The tour didn’t return and his promise to pay failed. Now they’re coming to collect. WHAT ABOUT A LAST UNICORN MOVIE REMAKE? Without a lawyer’s opinion, it’s hard to say, but it would help to fully detach Cochran’s suckers from Peter and his works. That would never happen if he got his way. Thankfully he’s no longer empowered by other people’s money to keep up frivolous litigation. It would help to speak out in support of Peter. However things go for his fight, at least he has freedom to create new works and a long lasting fanbase. Speaking of Cochran’s suckers – Espionage Cosmetics does NOT have Peter’s approval to sell Last Unicorn products, according to communication with Peter’s support team. So why did they say they do? Immediately after Peter’s lawsuit was filed, Espionage was featured in the January 8, 2016 installment of The Raven, “a free email newsletter from Conlan Press regarding Peter S. Beagle’s work”. Their contract may be with ITV and/or Cochran (in some form) but it’s not with Peter, and he hasn’t received money for it (to the best of his team’s knowledge) since the start of the lawsuit. Fans should demand proof, and buyer beware! With this going on, only accept verification about Beagle-related goods directly from his official social media: SupportPeterBeagle.com, and The Real Peter Beagle on Facebook or Twitter. Don’t buy any Conlan Press goods including ebooks on Amazon. Do buy from Tachyon, Peter’s current publisher who pays him. Not only is Connor not very good at business but he’s not very good at being a conman. He seems like a guy with mental problems, an over enflated ego, and the constant need to brag about how important he is or how busy he is. No one cares, Connor. They don’t care about you or your excuses, they just want what they paid for. The world does not care about you. Get over yourself. there are two parts to the movie remake- Peter had a few minor rights but rights a studio would want. ITV has the balance. They both have to play together. The problem is that Connor had Peter sign his rights to Avicenna. Just for the record… I am an individual who was promised a fancy Last Unicorn — with handwritten pages by Beagle and remarked by Conlan. Never received. It’s been years.